On every first Sunday you can visit with the Harlem Gospel Choir and enjoy a soul food brunch at The Howard Theatre. Here the Choir brings its experience of the Black Church to the U Street district in a foot-stomping, hand-clapping show for fans from around the world. 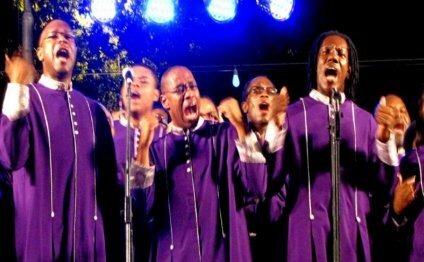 The world-famous Harlem Gospel Choir is the most renowned gospel choir in America and a preeminent gospel choir worldwide. It travels the globe, sharing the joy of faith through its music and raising funds for children's charities. The Choir was founded in 1986 by Allen Bailey, who got the idea for the Choir while attending a celebration in honor of Dr. Martin Luther King Jr. at the Cotton Club in Harlem. The Choir presents the finest singers and musicians from Harlem's Black Churches and the New York/Tri-State area. The Harlem Gospel Choir has shared its message of love and inspiration with thousands of people from various nations and cultures. The Choir strives to make the world a more loving and peaceful place, and through its music and dynamic performances to create a better understanding of the African-American culture and the inspirational music called gospel as it relates to the Black Church. The theme of every performance is "bringing people and nations together and giving something back."